I have been asked to respond to a recent article by Dr. Rien Havens in regards to the safety and efficiency of various Cannabis extraction methods. As the founder of Eden Labs, I have worked with all the methods in the article and our company builds extractors for all these solvents and more, for multiple botanicals. In responding, I hope to close a few loops (pun intended) in the issues raised. 20 years our goal has been to promote healthy extractions across every industry. Therefore we applaud Dr. Havens for offering some insight into the world of extraction as we can use all of the help we can get in helping the public, as well as governmental and legislative bodies understand the Pro’s and Con’s of differing methodologies for producing and processing any plant, not just Cannabis sativa L. in either of its cultivar’s. The most controversial part of the article was the section dealing with the alleged toxicity of co2 extracts so I will address that first along with toxicity issues regarding the other methods mentioned. It is absolutely true that water combines with co2 to form carbonic acid which can cause oils to turn rancid. This problem occurs frequently in co2 extractions done at very high pressures (over 5000 psi). However, Cannabis is usually extracted between 800-2,000 psi and at these lower pressures, the concern is that moisture will cause low oil yields and pull chlorophyll. Therefore Eden Labs suggests co2 operators reduce the moisture content of their herb below 10%. As long as this important step is followed, no moisture issues will occur unless the co2 is “wet” when purchased. Most rancid oils have more to do with improper storage. I have been in many botanical extraction facilities (Kava Kava, Sandalwood, Echinacea, Cannabis etc.) and seen containers of extracted oils in open containers sitting on shelves at room temperature. Not good. Note: you’ll notice that Hemp seed oil is always in the refrigerated section of a store. Cannabis oil should be kept refrigerated. The other toxicity issue was the ability of co2 to pull pesticides and other chemicals out of plant material. This is true as well. It is also true that all the solvents listed as better alternatives would also pull these chemicals. Co2, ethanol, butane, propane and ether are all non-polar solvents. Although they are all at different points on the polarity scale, they all are in the range where oil is soluble in them which means that most, if not all, of these other agricultural chemicals are also soluble in all of the listed solvents. Which brings up a point that should never go unsaid when this issue is raised…all consumable botanical products should be grown organically. That’s the bottom line. The same pesticides that are in Cannabis products are ubiquitous throughout our food supply. It is hoped by many in the Cannabis industry that we will help lead the way towards a healthier future through better production methods. Any of the protocols listed in Dr. Havens article would be superior to the conventional hexane extraction that is common in the food industry. Having said that, here are all the contamination issues with the solvents in the article: co2, as mentioned, can have water. Ethanol can have acetone and methanol that form during the fermentation process. Propane and butane can be contaminated with a host of impurities including, but not limited to, pentane, heptane, heavy metals, and what people call “mystery oil” which is pipeline lubricant. Steep Hill Labs has documented this. With proper research, all of these solvents can be procured in a pure form so contamination is avoided. The final issue was the source of co2 and the other solvents. Unfortunately, every solvent in the article is mostly made from petrochemicals. Even ethanol is often synthesized from chemicals derived from crude oil. It is possible to source ethanol and co2 that is produced naturally by fermenting plant sugars. A wonderful addition to our industry would be a cellulosic ethanol plant that takes waste plant fiber from hemp and cannabis production and converts it to ethanol and co2 to be used for extraction. It should also be noted that co2 and ethanol have the added benefit of being disinfectants. Bacteria, viruses and molds will be killed by these solvents although molds will not necessarily be rendered harmless. Propane and butane extracts, on the other hand, will actually attract certain types of bacteria that feed on hydrocarbons. For this reason, it is always advisable to double wash these extracts with ethanol to sterilize and to purge the trace amounts of hydrocarbon that become trapped in the thick oil. As to the notion that co2 is too costly and inefficient, my first thought was that it sounds like he is describing our competitors! Eden Labs has the fastest and most efficient co2 extractors on the market. 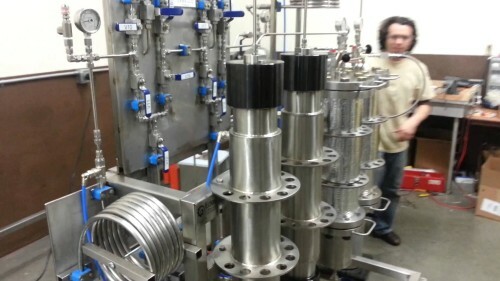 While it is true that a first stage hydrocarbon extraction is far faster and cheaper than other methods, by the time you figure in the time of the residual solvent purge and the cost of meeting the safety requirements, all the perceived advantages disappear. In addition, it is clearly evident and more cost effective to build out a production facility with the gratitude of local governmental bodies and the medical sector. This is a nascent industry, it has challenges and we feel our responsibility is to offer a path of least resistance and efficacy for our clients. In conclusion, we have found that on a cost/benefit comparison, ethanol is most efficient at small scale production. On larger scale commercial/industrial production, co2 wins which has been proven by the hops industry.